Every Polish person knows at least some of this story. At the urging of a group of holy women in Jerusalem, St. Luke painted the Black Madonna from life after Jesus' death, upon a cypress board the young Christ had fashioned into a tabletop for the Holy Family's use. The community of Christian women kept the image in Jerusalem until 328, when St. Helena took it to Constantinople along with other relics. In the 1200s, it came into the possession of Lev I of Galicia, whose wife was the granddaughter of the Byzantine emperor. Lev installed it in his castle in Belz, Ukraine, around 1270. Some hundred years later, Vladislaus II of Opole took possession of the castle. Not long afterward, when Tatars attacked, Vladislaus hung the icon on the surrounding wall. A fog arose, in which the attackers retreated, but not before one of their arrows scarred the Virgin's neck. In 1382, as a gesture of reconciliation with the Catholic Church, which had excommunicated him over a financial dispute, Vladislaus founded a monastery on Jasna Góra (Bright Hill) near Częstochowa in southern Poland, populating it with Pauline monks from Hungary. On August 26, 1382, he had the sacred painting installed in the Church of the Assumption there. In 1430, Hussite raiders left two sword marks on the Virgin's cheek. Although the Hussites were iconoclastic reformers, the attack was said to have been prompted by greed, not righteous fury. The raiders tried to make off with a wagonload of valuables, including the painting, but when their horses refused to move, they threw down the icon and slashed it. Immediately, they died, went blind, or lost use of the offending hand. The Catholic Church has honored the Black Madonna with four canonical coronations, in 1717, 1910, 1966, and 2005. As Pope, John Paul II visited the shrine four times; Pope Benedict XVI also made the pilgrimage, in 2006. In 1931, Pope Pius XI established August 26 as the feast day of Our Lady of Częstochowa in commemoration of the icon's move to Jasna Góra on this date in 1382. Tens of thousands of Poles converge on the shrine, many on foot, to honor their beloved Madonna with songs, masses, and processions. Major pilgrimages also take place on May 3, feast of Our Lady, Queen of Poland, and August 15, feast of the Assumption. 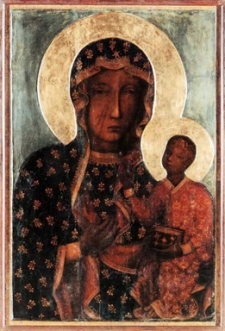 An Orthodox commemoration of Our Lady of Częstochowa on March 6 (March 19 Gregorian) recalls the miraculous appearance of a similar image in Moscow on that date in 1770. Art historians have identified three main layers on the icon. The oldest is a Byzantine encaustic (wax) painting of the 1200s, painted over in Italian style in the 1300s, and repainted in the 1400s after the Hussite attack. The Madonna's black mantle is covered with gold fleurs-de-lys, emblem of the Anjou kings of Hungary in the 1300s, with a single gold six-pointed star over her forehead. She seems to be wearing the night sky -- night that gives birth to the sun -- and in the Hodegetria or way-pointing pose, she gestures toward her child. But the appeal of the Black Madonna is not just symbolism, it's sympathy. Dark and wounded, she appears to understand suffering.